To develop this kit we worked closely with the people that matter the most, you guys! 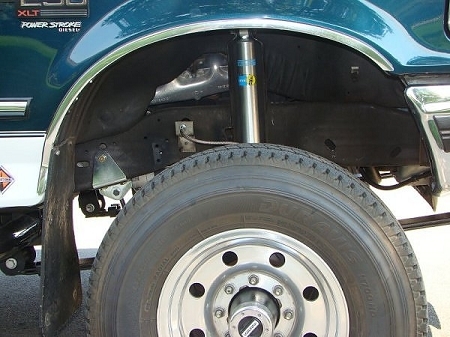 This was the first kit on the market to offer a complete bolt on RSK (reverse shackle kit) to use the Superduty springs on the 1992-97 OBS (old body style) trucks that requires no frame or bumper modifications. With this kit, you can bolt on our conversion hangers using existing holes in your frame and clear all factory bumper mounts and components. For trucks that are wanting to install an intercooler, we have designed the kit with optional bolt locations to allow additional clearance for most intercoolers end tanks. For this installation configuration, you will need to drill two additional 1/2" holes per side. The installation of this RSK kit will provide a noticeable improvement in ride quality. This is accomplished through the use of a longer Superduty spring and the relocation of the shackle to the rear of the spring. With that change, the truck is no longer fighting against itself when it hits bumps on the road. 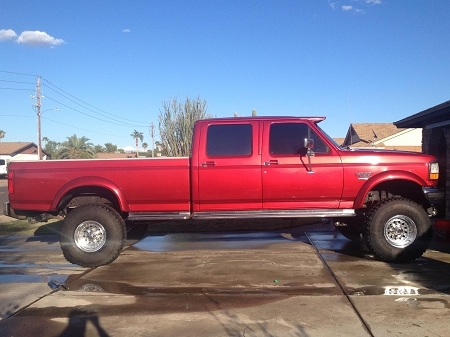 Instead, you will have a truck the drives and handles like a 1999-2004 F-250/350. The kit is available in 3 different lift heights. This is the lift amount of the kit itself. Please keep in mind that depending on what code of Superduty springs are used, you may have additional lift amount. The kit comes complete with the front hangers and rear shackles and all needed assembly hardware. Superduty springs and spring eyelet bolts are not included. The kit comes standard with a smooth square crossbar. This ties the two front hangers together and adds rigidity to the frame itself. The standard kits' crossbar is 1/8" wall thickness. 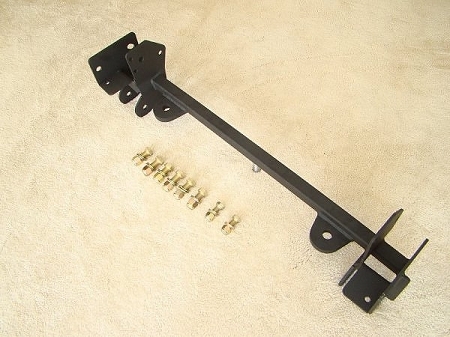 If you choose to upgrade to HD crossbar, tow hooks or a receiver hitch, we also upgrade the crossbar to 1/4" wall. If you are using a 1999-2004 Superduty axle, you must choose the SD Axle configuration so that the mounting configuration is correct! THIS KIT IS DESIGNED TO WORK WITH A BOXED FRAME RAIL. 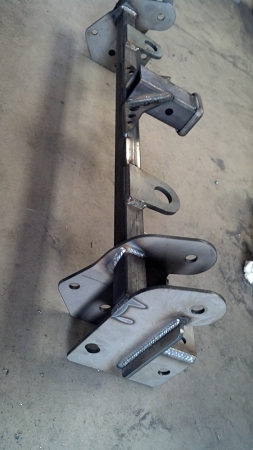 IF YOU HAVE AN OPEN FRAME RAIL, ADDITIONAL INSTALLATION MODIFICATIONS AND WELDING IS REQUIRED. THESE KITS ARE BUILT TO ORDER. TYPICAL LEAD TIME ON A BARE STEEL FINISH IS 5-7 BUSINESS DAYS OR 14-21 DAYS FOR A POWDER COATED FINISH. SPECIAL ARRANGEMENTS MAY BE MADE, PLEASE CONTACT US DIRECTLY IF YOU NEED FURTHER ASSISTANCE. YOU MUST USE OEM 1999-2004 SUPERDUTY LEAF SPRINGS OR SPRINGS THAT ARE BUILT TO THE EXACT SPRING EYELET TO EYELET LENGTH OF AN OEM LEAF SPRING WHICH IS 55 3/8"!! SOME AFTERMARKET LEAF SPRINGS ARE MADE TO SHORTER MEASUREMENTS WHICH WILL CAUSE ISSUES WITH AXLE PLACEMENT AND SHACKLE GEOMETRY. PRO COMP LEAF SPRINGS ARE PARTICULARLY PRONE TO THIS ISSUE!! I bought the 3.5 lift RSK for my 92 F350 last year. I am very happy with how the truck rides now. It was very easy to install and the customer service was top notch. The only thing I would have changed was I should have added the hitch and tow ring option! Thanks again and all my obs trucks will get this mod! I used 04 super duty springs from a friend that had # ADA stamped in them. I run 35's and it leveled it perfectly with all stock F350 rear. The ride is amazing, especially on those fast hard highway bumps where normally your head would hit the roof. Get the receiver, it's awesome and clears the stock bumper. I am beyond happy with the way this kit is made, how it fit and the ride of the truck after the install. 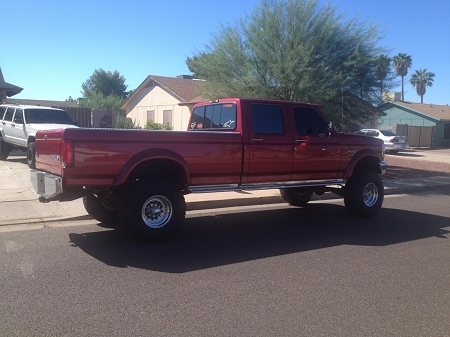 I am using the 2.25" kit on a CCLB f350 and used U code front super duty springs. The ride is night and day difference. No more harsh thuds in the cab. The kit fit great and all the bolt holes lined right up.